Winning The Impossible Fight is an easy to read & simple to digest breakdown of the first steps to take in your fight for freedom. In order to win any battle, you first need to understand what you are facing. This short booklet will help you think through where you are at in your journey and the best way to move forward. 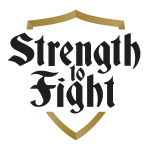 I’m thankful for Josh Gilman and the team at Strength to Fight. They have an important hopeful message, and also the resources to help parents, churches, and students to experience true freedom. For orders of more than 10, email connect@strengthtofight.ca.